Adhi Lukman, Chairman of the Indonesian Food and Beverage Association (Gapmmi), says he is optimistic that the investment targets that are set by Indonesia's Industry Ministry will be met this year. The Industry Ministry targets to see a total of IDR 63.25 trillion (approx. USD $4.6 billion) worth of private sector investment in the food and beverage industry of Indonesia, up 6.7 percent compared to investment realization in this industry one year earlier. If we take a look more closely, then we see that the Industry Ministry of Indonesia set a IDR 53.18 trillion (approx. USD $3.9 billion) investment target for the national food industry and a IDR 10.07 trillion (approx. USD $735 million) investment target for the beverage industry. Hence, total direct investment in Indonesia's food and beverage industry is targeted at IDR 63.25 trillion in full-year 2018. Lukman responded to the 2018 targets saying that he regards them realistic. Despite modest investment growth in Indonesia's food and beverage industry in 2017 (growing by only 1 percent year-on-year), this industry remains attractive due to Indonesia's huge population. Moreover, Indonesia can be used as the production base for the wider Southeast Asian region. Meanwhile, the Indonesian government implemented several deregulation measures that make it easier for the industry to obtain raw material supplies. Another factor that should boost consumption of food and drinks in Indonesia in 2018 is related to politics. This year is a political year as elections are held in the regions. The many events that are organized (related to these elections) always trigger an increase in the consumption of food and drinks in Indonesia. 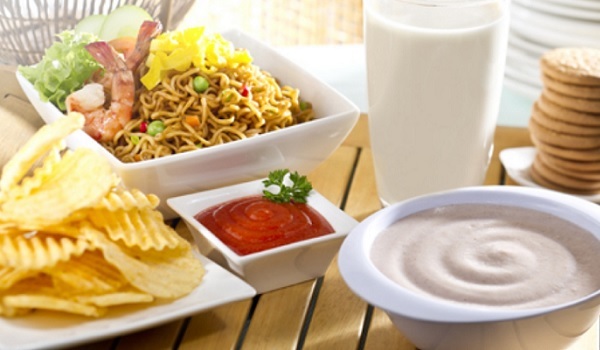 Direct investment in Indonesia's food and drinks industry is dominated by domestic investors. If we take a look at the data from the Indonesia Investment Coordinating Board (BKPM), then we see that 60.0 percent of total direct investment in this industry originated from Indonesian investors. Lukman said there are actually many foreign investors interested to invest in Indonesia. However, they are often scared off by regulations that are regarded unconducive. Among the top concerns of foreign investors are the availability of quality human resources and the availability of raw materials. Haris Munandar, Industry Ministry Secretary General, added that it are particularly several big local instant noodles and palm oil-based product manufacturers, all owned by Indonesian investors, that dominate the food and beverage industry of Indonesia. Moreover, these giants are always eager to expand their business by adding more production lines or enlarge production capacity in line with growing demand from the Indonesian consumer. Meanwhile, most of the foreign food and drinks players who invest in Indonesia are big as well but usually they set up one production line in Indonesia, hence their facilities in Indonesia become part of an international production chain. Regarding the soft drinks market, it is interesting to monitor whether there will be a rebound in 2018. Earlier this year, Triyono Prijosoesilo, Chairman of the Association of Indonesian Soft Drink Producers (Asrim), said Indonesia's soft drink sales had actually contracted in 2017 with the sales volume sliding by 1 percent year-on-year (y/y). It was the first time during his period as chairman that Indonesia's soft drinks sales declined. He attributed the contraction to Indonesia's bleak purchasing power, especially among the middle to lower class who account for about 40 percent of total demand in the nation's soft drinks industry.